​﻿Hello. 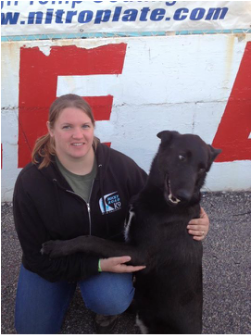 I am Kaitlin Clapper, I am the owner and Head Trainer at Rocky Road K9. I have been working dogs all my life. I was raised around Sheriff K9s and after school went to National K9 and became certified as a Master Dog Trainer. After that I started training in my hometown in Ohio. I was then given the opportunity to work for The Dog Wizard in North Carolina. In the past few years I have trained over a 100 dogs of all different breeds and personalities. I have certifications in: On leash Obedience﻿, Off leash Obedience, Behavioral Modification, Tracking, Scent Work, Police K9 Training, Assistance Dog Training and more. ﻿I currently own four German Shepherds Luger, Sully, Thunder, and Jaxx. I am also a K-9 unit for a local security company. Jaxx is my everyday partner both with the business and on the streets. I look forward to meeting and working with you and your dogs! Jaxx is 4 years old. He was an owner surrender because he started to show aggression towards people and the family had no choice but to rehome him because of small children in the home and there were no trainers in their area. He came to me from my hometown in Ohio. His training started immediately and since has been a great addition to our family. He helps me socialize other dogs and helps them fit into the pack when they are here for training. Jaxx has also started Personal Protection work and has excelled in it greatly. Jaxx and Kaitlin are now also a K-9 unit for a local security company.